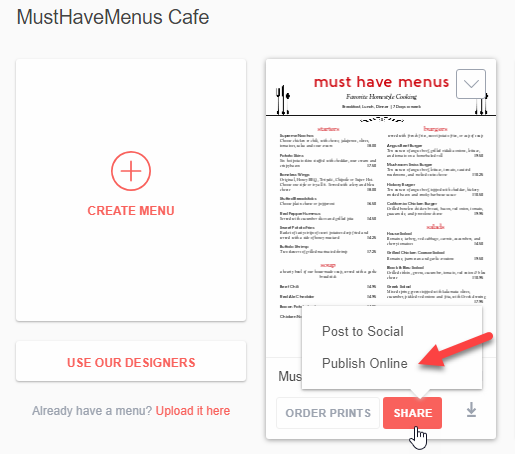 Click Share below your menu then Publish Online to show the publishing screen. Click the Facebook App button to begin. The first time you publish a menu, you will be prompted to follow a series of Facebook permissions which are necessary for the MustHaveMenus app to install correctly. After following the prompts and publishing your first menu, you'll see additional options from My Menus. Be sure Post to Page so your customers don't miss your latest menu or event flyer. After you've updated your menu, you will be prompted to update the online versions from the Publishing tab (on the left side of My Menus).